Neamt County is the blessed place in which arose monastic places representing as many treasures of monastic life dedicated to God. Our pilgrimage can start from the first church of the Roman Diocese, which was dedicated to the Holy Friday, built by the father of Alexander the Good, Roman Voda from which It shall be taken the name the town too, today the Roman city. Back then housed royal bones and was therefore chosen to be bishop’s residence since that time. Petru Rares ascended on the church emplacement a new church dedicated to St. Paraskeva that we admire today as an great architectural accomplishment, eloquent proof of decorative craftsmanship at which had become the art and culture of that agitated era. That is why the Episcopal Cathedral Roman work of inestimable value of the Romanian genius, is included in the national and world patrimony. 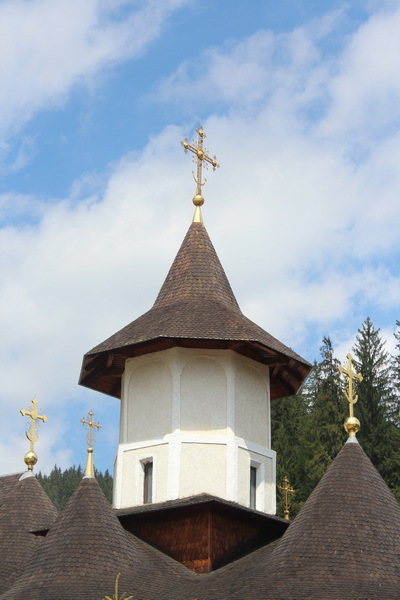 Following our itinerary, we are heading then to Neamt Monastery, the Romanian Orthodox Jerusalem, as it is called, located on valley of the brook Nemţişor, in a glade covered by a holy silence, surrounded by wooded heights of the Neamt mountains. It is established there by monks since the reign of Peter Musat, who built a stone church, which subsequently other rulers surrounded with stone walls, buildings and cells. Then the monastery was strengthened in the time of Alexander the Good (1400-1432), but will be ruler Stephen the Great, who built in 1497, in the inside the monastery, after the victory of the Codrii Cosminului in the same year, the Church of the Ascension of the Lord, representative monument of architecture and plastic mural decorative of his time. In the monastery museum are objects of an acknowledged historical and artistic value asː icon of the Virgin, called Lidianca, received as a gift by the Alexander the Good from Emperor John the VIII Palaeologus (1425 – 1448), icons painted by Nicholas Grigorescu (1838-1907), an Epitaph from 1437, different objects of worship. Arrived at Secu Monastery, built in a corner of paradise, from the time of Petru Rares, you are amazed by the beauty of the place with white buildings, with multitude of flowers of the side of the alleys, beauty of the paintings that adorn the church built between 1812 -1818. The patron of the church is celebrated August 29th, the day of the Beheading of St. John the Baptist. The monastery keeps in the museum a valuable treasure made up of beautiful objects of worship, crosses, gospels, manuscripts and prints with significance historical and artistic value, of wich we mention: The Air representing the Burial of the Saviour, embroidery wrought in gold thread, pearls and gems (1608) or Homiliary of Metropolitan Varlaam (1643). Not far from Secu, deeper into the forest, we discover Sihastria Monastery, founded in 1655, with church, cells and those necessary for a monastic life of the monks, sought by the pilgrims who came to the Cave of Holy Theodora from Sihla and then, thanks to Father Cleopa Ilie, one of the most famous Confessor of the romanians. After times of tribulation which meant incursions and depredations of the tatars, the turks, the arson of the monastery from 1821, the loss of the thesaurus, the monks refuge in other places, there followed years of restoration, reconstruction. The monastery church was built in 1825 with the patron Virgin Birth (September 8th). Following our route, we head Petru Voda Monastery, located in the glade Haşca at the foothills of Stânişoara mountains, build there by Archimandrite Iustin Pârvu in 1991, unique place in Romania, known both as a center of pilgrimage and ecumenical tourism in Neamt County and also as a Memorial of the Martyrs of the communist regime prisons: Archimandrite Iustin Pârvu, Father Atanasie Stefanescu, Poet Radu Gyr. The monastery is dedicated to the Holy Archangels Michael and Gabriel (November 8th). At the initiative of Father Iustinian Pārvu in the monastery was founded an elderly house, an orphanage with two classes (of I and II), and a medical dispensary for providing medical assistance. From here we start to the final objective of proposed pilgrimage, monastery Durău. First arisen in 1779 as a settlement of nuns, then a monks hermitage, monastery is located in watering and climatic resort Durău at the foot of the mountain Ceahlău considered the holy mountain of Romanian Orthodoxy. The present church, dedicated to the Annunciation (March 25th) was raised between 1830 -1835, been painted in 1935 by Nicolae Tonitza with his disciples. Inside the monastery Durău, exists, since 1996, The Pastoral Cultural Center St. Daniil Sihastrul. 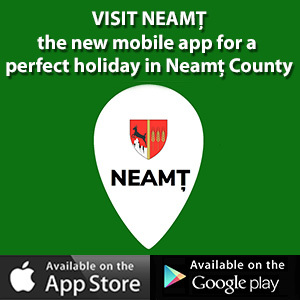 Here we conclude the ecumenical journey that we propose but we will continue to present you other itineraries in which to discover the spirituality, culture and historic heritage of the places from Neamt.